Choosing the right surfacing to go beneath your climbing frame can add decorative interest to your garden but can also ensure that your children are kept as safe as possible as they play. Safety surfacing provides cushioning to help prevent injury if your child falls from a climbing frame. This sort of absorbing surface should be considered under all garden play equipment where there is a fall of over around half a metre or more, such as on a wood climbing frame. You might also want to install a safety surface regardless of the height of your climbing frame or other outdoor play equipment if items are to be placed where there is concrete or tarmac. Read more about play safety on the Rospa website at http://www.rospa.com/play-safety/advice/. Loose-fill mulch: Rubber mulch is a durable option and can be good for the environment if it is made from recycled tyres. It is available in a wide range of colours and should last for years to come. 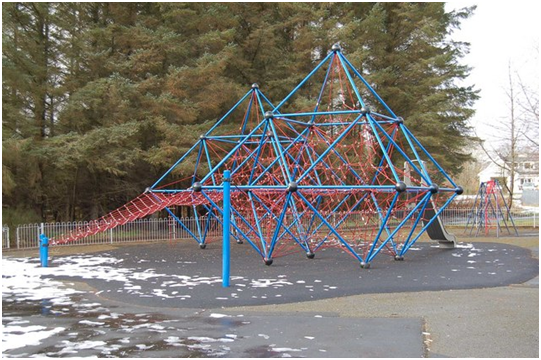 Rubber mulch used beneath a wood climbing frame or other play equipment, will also not retain or absorb water and will not freeze. It can also offer effective protection for falls from as high as 12 feet in some cases. Engineered wood fibre: This can offer an organic look while providing plenty of shock-absorbing cushioning. 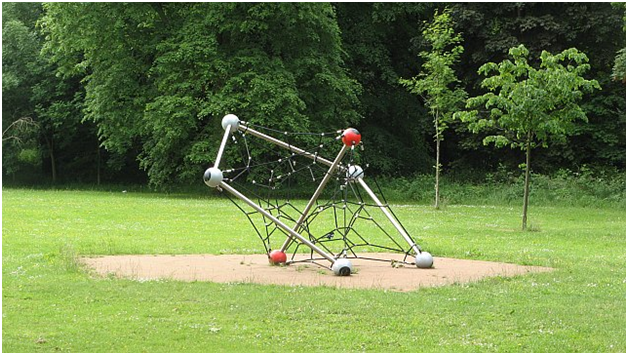 It is created to form a compacted layer and should be able to easily support the likes of pushchairs or wheelchairs. Rubber tiles or matting: This is a good choice if low-maintenance, good shock absorption and durability is a priority. Sand: This can be a natural way of absorbing impacts below outdoor play equipment such as climbing frames and swings. This is not the option if you are looking for a low-maintenance choice, however. Grass: This is a good, multi-purpose surface at times but will offer little shock absorbency when very dry and is prone to damage through excessive use. Synthetic grass: Fake grass can be a cost-effective choice, although prices may increase substantially if a decent amount of impact absorbency is required. Wet Pour: A great no-maintenance option which creates a rubber surface that is slip-resistant and extremely durable. Wood chippings: These can look attractive but are prone to trapping moisture and can lead to unpleasant, damp smells in some environments.